This week has been one of those weeks that are supposedly “typical” for moms. Had strep throat. Got a shot. Survived. Cleaned house frantically, did laundry, had party, need to clean house again. Husband out of town on business, running him to and from the airport. Planning Clark’s class Thanksgiving party. Research out craft and treat ideas online. Make phone calls and design fliers. Meals. You know, breakfast, lunch, dinner. Every day. Walking and/or driving children to/from school, 3 different schools, 3 different schedules. Exchange emails to plan upcoming Relief Society activity. Taking Grant to friend’s birthday party. Buying gift. Volunteering with take-home reading at Clark’s school. Return what seems like hundreds of phone calls and emails. Eating all of the leftover cupcakes from Natalie’s party. See? It’s all totally normal stuff. And yet? Mind-numbingly exhausting. I recommend you don’t make a list like this unless you have time to take a nap afterwards. Then again, it’s a nice reminder you actually got stuff done. Moms rock. I totally thought that said you Got Shot! I have had to go to town every single day this week. Not a big deal for most people, but for me it is! It takes 40 minutes just to get to town and one trip to town costs $15 – $20 bucks in gas. Ouch. But…each trip was taken with a different child and we got to spend one on one time and enjoy each other’s company so I guess I can’t complain all that much. I am highly in favour of Done Lists. We need to reflect sometimes on all that we’ve accomplished, if only to explain to ourselves why we’re so darn tired. I’m keeping a Done List for every day this week, to help remind myself that I DO accomplish things every day. Hope your list helps you see how amazing you are! You totally deserved those cupcakes. Eating leftover cupcakes would most DEFINITELY be on my to-do list 🙂 You deserve something after everything else you had to do. I guess you would not be you if you were not making signs somewhere in there! My week was the same. Well, not really, but I swear my To-Do List grew every day and at the end of each day, I was exhausted. I’m so glad it’s Saturday and we only have 4 things that we must do. That’s the kind of week we’ve had. Wow, your week looks crazy! Mine was mostly filled with waddling to and fro and wishing for a baby. I hope you can get some rest – good job. I’m feeling it too. it seems like everyone is feeling an intense time of being busy and having so much to do lately. I don’t know what is going on with that. 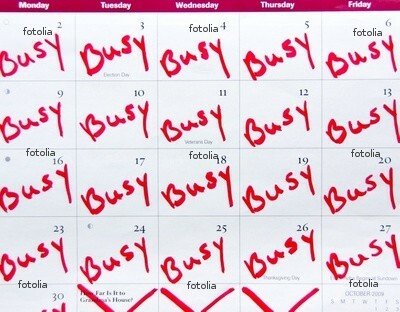 Definitely not as busy as yours! 🙂 Hope you’re surviving this week!